If you want to be the most successful garage door repair company in your community then you have to be willing to go the extra mile to show your customers that you truly care about their needs. Our garage door company has worked very hard to earn a reputation we can be proud of in our community. Our goal as a garage door contractor has always been to not only meet our customer’s expectations but to exceed them clearly and completely. We ensure that our garage door technicians are knowledgeable, professional and friendly at all times. Perhaps most important of all; we listen to our customers. We hear what they have to say about their needs and then we address them to the best of our ability. Of course our garage door repair company wants to be there when our customers need us the most. The only way to accomplish this task is to do what we have done. We offer emergency garage door repair service twenty four hours a day and seven days per week. This guarantees our customers that we will be there for them in their time of need regardless of what time it is. In addition, we also do our very best to provide same day service for non-emergency garage door repairs. Being there for our customers is important to our garage door company and it is part of the foundation that drives us, motivates us, and makes us so entirely unique from other garage door services in our area. There is not a garage door repair that our garage door contractor cannot take care of for you. Our technicians have the experience and training it takes to do the job right the first time. One of the garage door repairs we address is a garage door off track. Unfortunately garage doors will slide off the track from time to time. However, it is not something to stress over because our techs can place that garage door back on track in no time at all. Often times this repair is caused by a damaged garage door track. It just so happens that our garage door service has an answer for that problem. Our garage door technicians can replace the track if needed or simply repair it so that the door will no longer slide off of it. Another garage door repair we often confront is that of a broken emergency release. In many areas it is mandatory by law that your emergency release be in operating condition. More importantly; the emergency release is there for emergencies so that you can prevent garage door accidents from occurring. Don’t allow yourself to be in a situation where you go to apply the emergency release and nothing happens. Then it could be too late. Our garage door repair company is always ready to help you with your broken emergency release. Another area where our garage door company can help you is to replace section of garage door. We know that accidents are bound to happen. Garage doors get damaged and when they do it often looks worse than what it is. 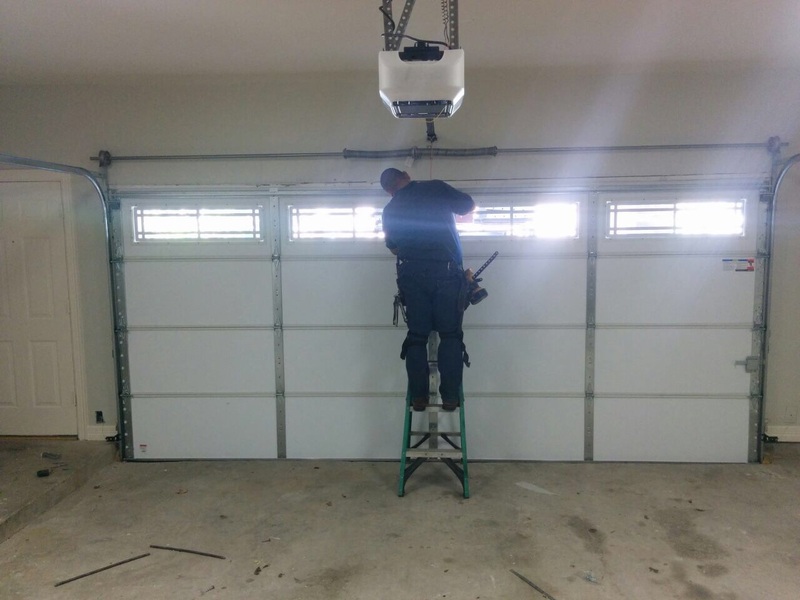 Before you up and replace the entire garage door; give us a call because more often than not we can replace section of garage door and have your garage door looking brand new; saving you a ton of money. When it comes time to weatherize your home our garage door repair company can install the weather strip for your garage. The weather strip will help keep that cold air out or in depending on your desire. In addition, we can repair or install the bottom garage door rubber. The bottom garage door rubber is used to keep debris and small pests out of your garage. It is always good to ensure your bottom garage door rubber is in good shape.